Poutine is a staple in Canada with regions making their own version and it is usually served with gravy and cheese. 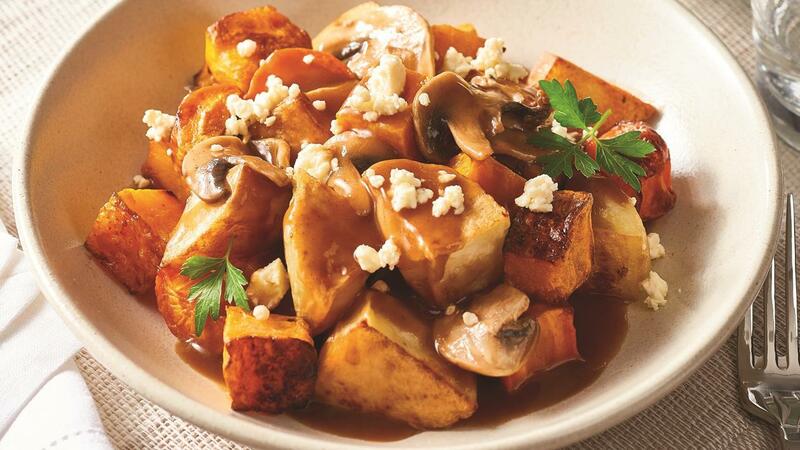 Add mushrooms to the gravy for a popular flavour with residents. Peel and dice the potato, pumpkin and carrot and drizzle with oil. Bake at 180C until golden. Add the cottage cheese and cook for 5 more minutes. Sauté mushrooms with oil in a large pot until browned, add water and whisk in CONTINENTAL Professional Rich Brown Gravy until it thickens. Serve with a fresh seasonal side salad. Tip – Use other vegetables like beetroot or sweet potato instead of potato and carrots for a different version of this dish.